Caleb "Achy Dad" Clark: Parent Fail! Our 2yr old fractures her arm during test of family cargo bike. Parent Fail! 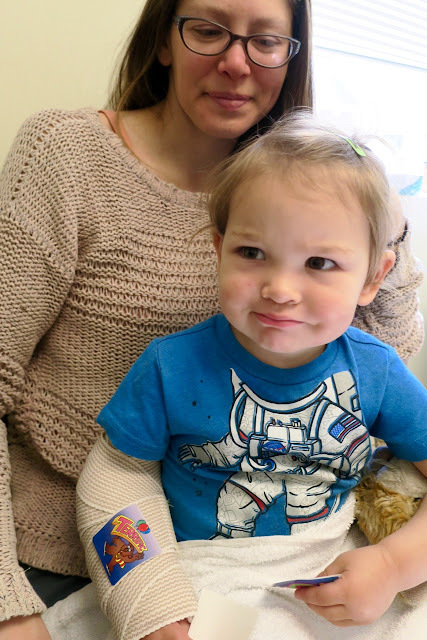 Our 2yr old fractures her arm during test of family cargo bike. 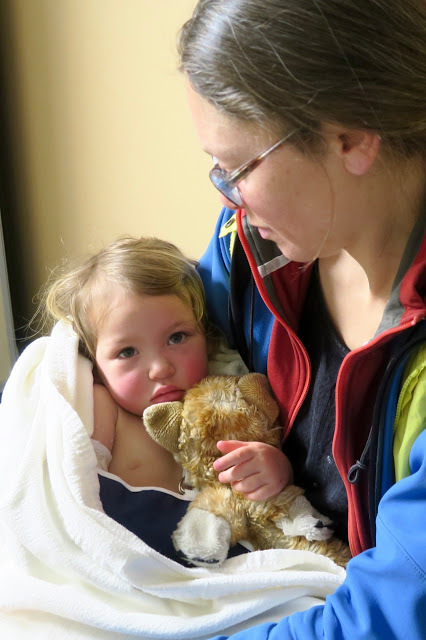 Our 2yr old daughter got a minor fracture when our longtail electric-assist family cargo bike tipped over while stopped. 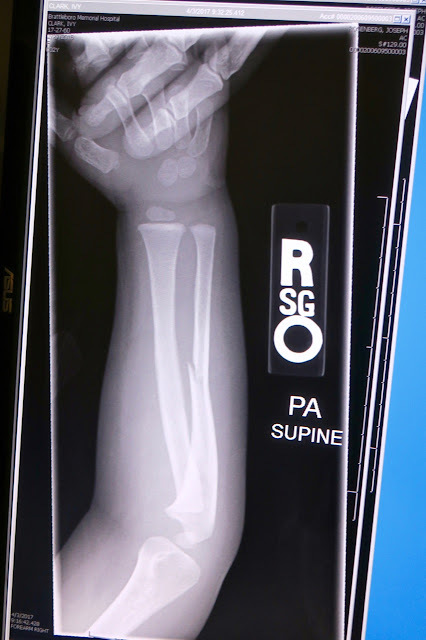 The fracture happened in a "good" place, the docs said, not near any growth plates. And kids at this age heal very fast, apparently. 3 weeks total forecast now, but 6 weeks when were first in. 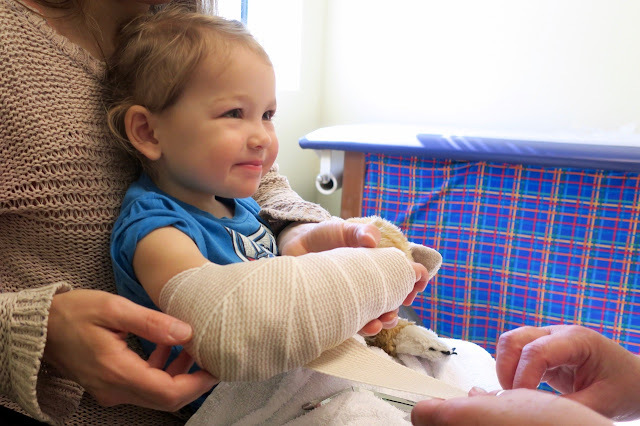 Ends up she didn't even need a cast, just wrapped her arm stiff fiberglass and ace bandages above the elbow, refreshed once a week. Intuitive frown? She was happy while riding though. This is the setup during accidental tip over. This is a hard post for me to write, and for me to get right. I don't consider this anyone's fail but ours. The bike and seats performed as advertised. I think it's important to help others hear the story and be able to make their own judgements. The bike wasn't moving when it fell over. My wife was testing the bike on a quiet street with our 2-year old in a Yepp Maxi seat and our 5 year old holding a t-bar handle. It started to tip and my wife couldn't stop it. Ourdaugther's arm happened to get between the seat side and pavement. She's fine. She has since jumped back on the bike, but we're taking her for a ride until she's three. We live in a bumpy hilly town with few bike paths. Here's the setup we were using. The bike is a used Radwagon. I love it - still. The seat is a Yepp. Great seat and setup. Very easy to use. Solid. But, you can sense from this photo that it's top heavy, and back heavy for a small rider like my wife. My wife's first test was great. With one kid on back, low, near our back. This felt very stable. Moments before the fall, which happeneed at a stop sign in our quiet neighborhood. Wet fiberglass fabric stiffens as it dries. Sticker. Total heal time about three weeks, not the six they said originally. Good expectation management though. Mistakes as we see it: Here's where the parent fail comes in: not following our little whisper inside voices (instincts). The setup was heavy, rear-heavy and top-heavy for my wife's stature and weight. I'll take most of the heat here. My first full-time summer job was as a bike mechanic. I felt uneasy about high strap-in seats on bikes with full-height back wheels. 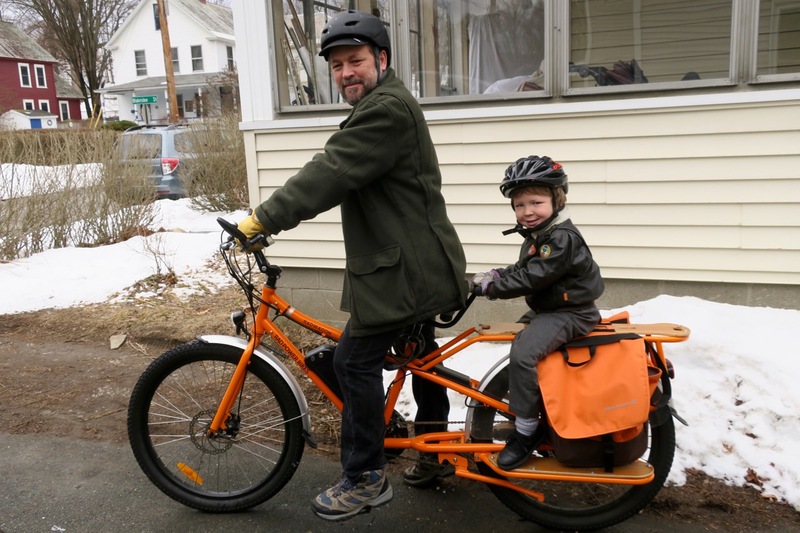 I was attracted to bucket-type family cargo bikes, and cargo bikes with small rear wheels from the start (See some here on EBR.com). My wife was, too, but I also had the lots of bike experience to back up my instincts. We had a sense the weight was a bit high-feeling and in the rear, and it was heavy for my wife. And we had "monkey bars" or a "caboose" coming in the mail (they act as rails around kids midsections and break side falls). But we didn't wait...they might have kept our daughter's arm from fracturing because the seat edge might not have hit the road at all. No wonder bucket bikes are so popular. They are low, slow, and safer. And no wonder more cargo bikes are using smaller wheels that keep kids low to the ground if kids are in actual strap-in seats. Also, we should have waited for monkey bars on the back. 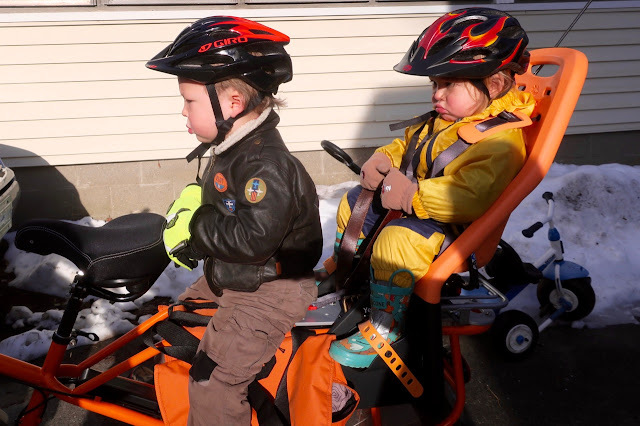 The main take away: low center of gravity is needed and heavy bikes need strong riders. 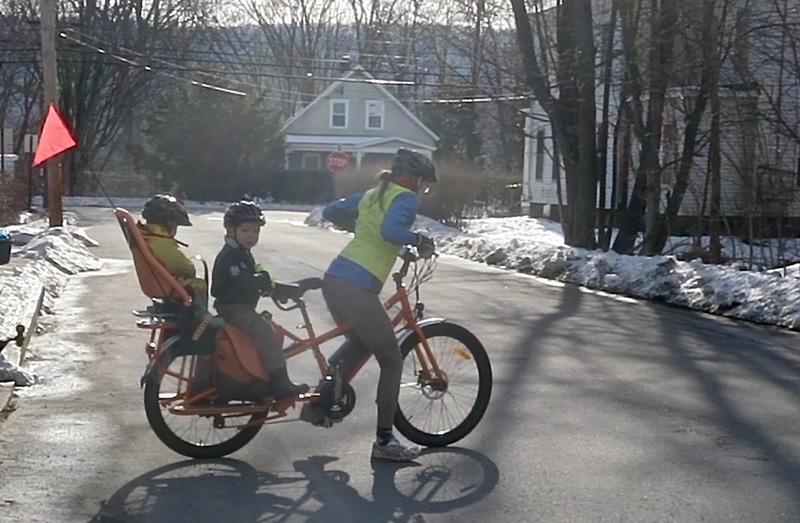 Success as we see it: We tested on quiet flat streets, starting with one person, a parent and child and only then two children. This means our fail happened while the bike wasn't moving and no cars were around. I love the Radwagon for myself. It's short and stocky. Big tires. Good breaks. Great price new and used. It isn't as slick as the twice as expensive Xtracycles or Yubas, but how could it be? It is shorter which I like. I love taking my son on the Radwagon. He thinks it's the funnest thing ever. I feel solid on the Radwagon with him on side streets, side walks, and our new monkey bars. 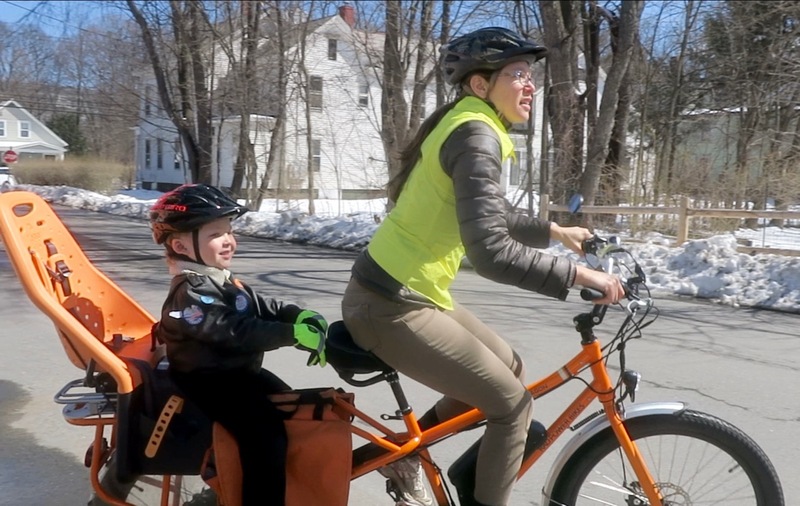 My wife and I are loving electric assist bikes family cargo bikes. We'll keep riding them alone and with our kids in certain situations. We have two now. A used Radwagon, and a used Raleigh Detour. 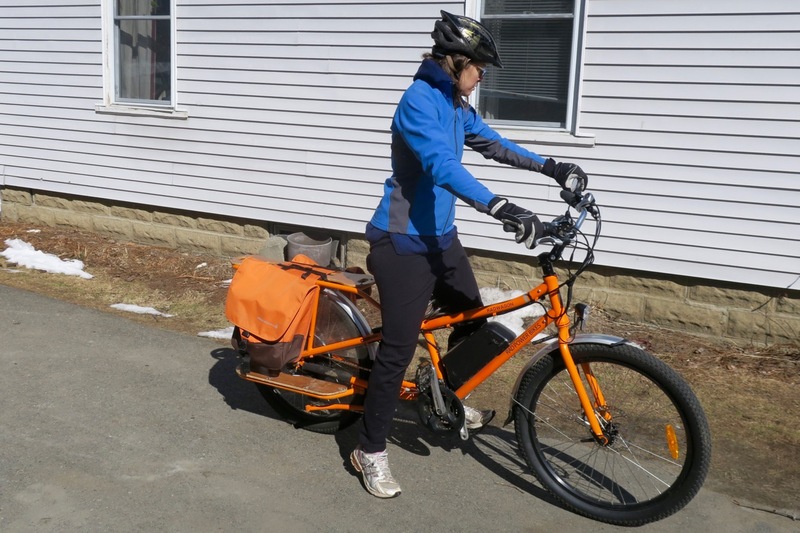 My wife and love going on rides together around town because the electric assist "flattens" our hilly bumpy town and makes the rides more relaxing and fun. I didn't research downsides when shopping for family cargo bikes. 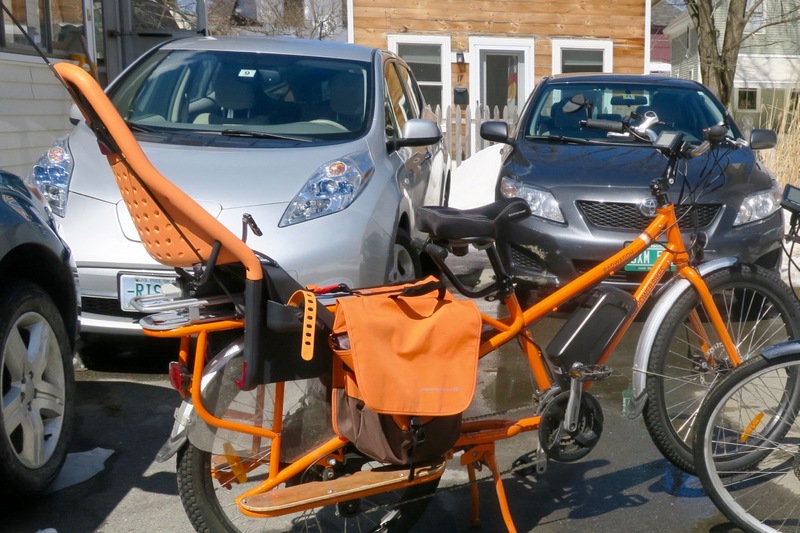 The electric-assist family cargo bike movement is so exciting, cool, sustainable, green, logical, and freeing that I found I didn't also look into the down sides. I didn't want to. The fantasy of the family cargo bike is real I think, but there's an element that I sense is similar to RV campers and boats. Only the zealous few really use them as much as they thought they would, for as many years as they thought they would. The reality of weather, terrain, traffic, growing kids, maintenance and laziness conspire to reduce the use a bit. I see the evolution of family electric assist bikes seems to be to bring down the center of gravity and stabilize the bikes more using 20" wheels where the kids site, buckets, tricycle setups, etc. I think we're really heading to more and more bike lanes and basically small electric cars, some of which could be peddle-able. In a small way, I think electric bikes (and cars in a big way) are changing the world. More people will become active for longer in their lives. Sone distances are literally smaller. A hilly mile to a school on bike path now feels like 1/4 mile used to. I belive this will increase real estate values for houses close to schools and services that are also along good safe bike routes. 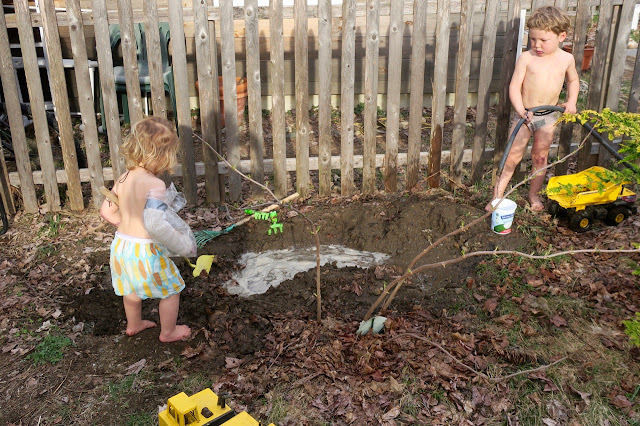 With two kids, we're going to get a new bike set-up that has them low and in monkey bars or a bucket. We'll make sure to ride on side streets, slowly and on sidewalks when near busy streets. As always, we'll wear reflective gear and have flags, etc. 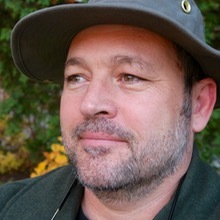 Brattleboro presents a challenge due to hills and bumpy side walks. So, sadly, the tricycle bucket bikes used in places that have bike lanes and flat terrain might not work so well here. But maybe a Babboe City Cargo Bike if we can get a loan. There's the Virtual Gondolier Plus (EBR review).